2016 Stand Up. Speak Out. Day of Action! On September 15, CCRSB will begin its fourth year of Stand Up. Speak Out, our school-board wide movement and commitment to healthy relationships and Social Justice! 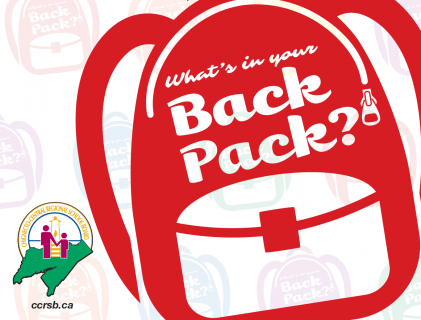 To help all of us gain a better understanding about what Social Justice is, we’re focusing on the theme, “What’s in your backpack?” We all carry invisible “backpacks” made up of our class, our gender, our sexual orientation, our abilities, our race and much, much more. As a community, we all have a responsibility to try and understand and accept what’s in someone else’s backpack. We’re asking all students, and their families, to tell us what that theme means to them. You can write a poem, draw a picture or poster, take a selfie, make a short video…do whatever you want to show us what’s in your backpack! Send your submissions to SocialJustice@ccrsb.ca, tweet it to us @CCRSB_Official, post it to our Facebook page or fax us at 902-897-8989. If you want to learn more about CCRSB’s approach to healthy relationships visit www.ccrsb.ca/standup. You can access lots of information there as well as download our handbooks.